We had a bit of snow last week. It was more than enough to coat the roads and bring out the plows. Usually this is the type of weather that would send me searching for action but with a newborn in the home it just isn’t the best idea at the moment. Thankfully the Town of Sullivan Highway Department follows a fairly reliable schedule that happened to coincide with one of the many feedings and diaper changes that now make up my life. Here we see one of their Mack Granites making a turn at the end of my street. As suggested in the past by some witty individuals maybe I should change the name of this website to Daily Diaper Dose? 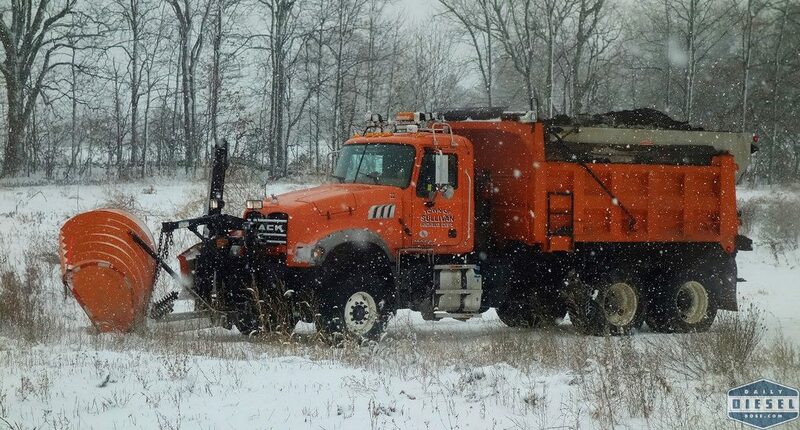 This entry was posted in Snow Plows and tagged mack granite, town of sullivan. Bookmark the permalink. Nice. This must have been the one Sonny told me he had on order the year before he passed away as it was definitely not there when I last visited. Interesting to see number 22 as we never got past number 18 when I worked for them 30 years ago. I like that extra step design for getting into the cab!